I don’t need comedic actor Will Ferrell and uber-hypocrite Brad Pitt lecturing–and lying to–me about what happened in the 2008 mortgage crisis. But that’s essentially what “The Big Short,” in theaters today nationwide, is. “The Big Short” (TBS) is a smug, arrogant, lying, preachy, gimmicky mess, the narrative of which bears little resemblance to what actually occurred in the mortgage meltdown. Brad Pitt executive produced this movie. And while Ferrell isn’t in the movie, his guru–Adam McKay–wrote and directed this crap-pile. McKay is the director of such movies as “Anchorman: The Legend of Ron Burgundy,” its sequel “Anchorman 2,” “Talladega Nights: The Ballad of Ricky Bobby,” and “The Other Guys”–all Ferrell star vehicles and all dopey, juvenile comedies. He’s also the writer of liberal “short” films, “Cops: Ferguson” and “Mexican Donald Trump,” as well as several other Ferrell flicks, including the disastrous anti-“White privilege” comedy, “Get Hard.” TBS is in the same “spirit” as these–a preachy, lying liberal message, bad jokes, and a lot of gimmickry. Throughout the movie, there are scenes form pop culture at the time. Who cares? Also, airheaded bimbo starlets like Margot Robbie and Selena Gomez talk to the screen and “explain” to you complicated financial issues. Haha, funny. Arrogant leftist chef Anthony Bourdain uses cooking analogies, like putting bad fish in his stew. Wow, soooo insightful. Actually, not really. Based on a best-selling book of the same name by liberal writer Michael Lewis, TBS follows three groups of investors who discover independently of each other that mortgage investments–specifically subprime mortgages issued to people with bad credit and little income–are going to collapse. And, so, they bet against the market and win gazillions. The movie, while respecting these very smart and insightful investors, also mocks them. Dr. Michael Burry (Christian Bale), a medical doctor and brilliant hedge fund chief at the time, is mocked for his glass eye, and his Asperger’s Syndrome. Mark Baum (Steve Carell) is mocked for being Jewish–a religion with which the movie seems to have a sub rosa obsession. We are introduced to his stereotypical, silly rabbi who taught him Talmud as a kid and is upset with him for questioning the Talmud and the word of the rabbis and G-d. That’s interesting because even the most religious Judaism encourages adherents to question everything. Oh, and by the way, when they make a movie mocking Muslims, imams, the koran, and those who study it, please let me know. Baum and his minions are approached by a sleazy, pseudo-Jewishy investment banker, Jared Vennett (Ryan Gosling) who tells them about the collapse of the housing market and wants to sell them investments shorting the market, so long as he gets a huge percentage in fees and cuts. There is also a third group–a couple of young investors eager to make a lot of money, who stumble onto information about the collapse of the housing market–one of whom has a Jewish-sounding surname, Geller. The pair involve their eccentric, retired, wealthy former investor friend (Brad Pitt) to obtain the licenses they need to short the mortgage investment market and make a killing. TBS allegedly tells the story of how the housing mortgage market collapsed. And you guessed it: the banks and Wall Street are the villains. Never ever mentioned in this extremely long diatribe is the fact that banks were forced to grant mortgages to minorities who were not creditworthy and that government regulators regularly told banks they weren’t allowed to use that RAAAAAYCIST! criteria called “credit” to issue loans. Instead, banks were forced to give credit and mortgage backing to people from the poorest cross-sections of America–people who would never ever be able to pay it back. But the movie doesn’t show you any of that. That would be racist, and you should know better than to use your “White-privileged” call for facts and accuracy in a movie. Also, it’s beyond the comprehension of Margot Robbie and Selena Gomez and their abilities to memorize scripts and look pretty. Instead, the banks are the big, bad evil villains who take advantage of poor people. No responsibility is required here on the part of those poor people because we are apparently required to accept at face value that all poor people are idiots–like the White stripper the movie shows you with her five condo mortgages. She isn’t supposed to be able to do the math or understand when the ARM portion of her mortgage comes into play and her payments go up significantly. The bad guys are the two evil White men–one of them a former bartender and the other a Yale grad–who wrote up the mortgage policies and approved the stripper because–come Monday morning–they are selling her subprime mortgage to a bank or some other investors. White privilege again. The privileged White guys tell us about their primary mortgage candidates: NINJAs (No Income, No Job or Assets). Again, the government–not the banks–rigged the system this way. The movie assumes and puts forth the assumption on you as fact that banks gave subprime loans to poor people and investment houses backed bonds in the mortgages because they knew the government would bail them out. But the fact is that most banks and investment houses lost money on these, and they aren’t in the business of giving money out only to know they won’t get it back. Whether or not the government bails them out isn’t a foreseeable result and not something any banks were counting on. Remember Lehman Brothers? Nobody bailed it out. The movie also mentions investment houses selling these crappy investments to “ignorant people” who are average investors and retirees. But what do banks do when they are forced to give bad mortgages to poor minorities who don’t make payments? They sell them to another bank or investment house and the cycle continues. The government caused this, not greedy bankers. That’s not to mention that Fannie Mae and Freddie Mac back a lot of these mortgages. Without those agencies, a lot of these mortgages would never have been issued. Maybe the one accurate thing in this movie is the portrayal of federal regulators who were unwilling to investigate the mortgage investments and their artificially high ratings. As the movie notes, government regulators are always looking to get private sector jobs with the parties they “regulate.” And, as the movie fails to note, government workers are lazy, politically correct, and have zero creativity, imagination, or incentive to do anything of value. But, as I noted, here’s what government regulators are, indeed, willing to do: I have a close friend, who is now retired but was a part owner in a bank until relatively recently. And he told me that every month bank regulators were at his chain of banks, breathing down bank officials’ necks, looking over the books, and making sure that a certain percentage of the bank’s loans went to minorities, especially the mortgage loans. Since not enough creditworthy minorities patronized the bank, my friend and his fellow investors had no choice but to issue loans to minorities who would predictably fail to pay back their loans. And the bank would sell those loans to another party . . . at a loss. That is the price of doing business as a bank in America today and was in 2008 and before. But there is no “The Big Short” movie about that. Facts are stubborn things. It turns out, though, that Hollywood liberals bent on an agenda, are more stubborn. And that’s why this phony baloney movie is served up on the ignorant American movie-going public. Posters for this movie announce, “THIS IS A TRUE STORY.” Uh, no it isn’t. The acting in this is good, but the story is a big fat lie. You see that–they just did a Big Short on the truth. Excellent takedown of this crappy prog-fest. Yes, the Affirmative Action policies of the Government certainly were a key to what happened. But many of the investors were also at fault, wanting quick fixes, and assuming, on some level, an entitlement to quick and large rewards. Investment always entails risk, but all too many investors thought that their investments should, in essence be risk free. At an extreme, there were the day traders, and even now, there are commercials, especially on talk radio, urging people to flip mortgages. Bubbles such as those in real estate certainly can be aggravated by government regulations, but I don’t think the investors in this case should get a pass. Enron, was in a different category; all too many employees didn’t know what was going on, and couldn’t really be expected to. Government regulators, of course, are mostly interested in ensuring political correctness. How are the rich supposed to get wealthy off of the poor? By definition the poor don’t have any money. Surprise, surprise, surprise. (That is, about this film, the agenda it’s pursuing, and twisting of facts to advance same.) This may also serve as a warning that the upcoming “Daddy’s Home” with Mr. Ferrell and convicted felon Mark Wahlberg looks like it too may be stinkworthy, if nothing else than based just on who’s in it. The government IS the real culprit here as DS said. They DEMANDED the mortgage companies issue loans to everyone who could fog up a mirror, income not necessary. And as usual, no one can see that. (They-the fedgov- are also responsible for the BP oil spill, but that’s another story) Debbie has it right, AGAIN! If the spill had happened in shallower water or on land,the spill would’ve been contained quickly…no problem. But because of big gov’t bowing to the god of the “Greenies”,oil companies have to drill in these insane depths and then you have these types of spill containment problems. Debbie is right about the blacks and Hispanics, and nonprofit housing activist groups and supporters in Congress and the Clinton/Bush administrations, who covered for them. They all played a major role in setting in motion the mortgage crisis. The film didn’t look at that part. That said, the Wall Street greed part is real. It’s not some screenwriter’s fantasy. 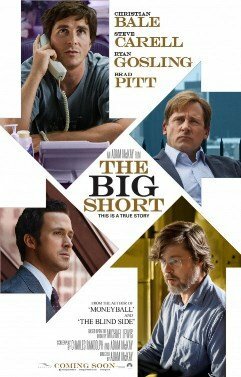 The movie rightly mocks Wall Street. I write about this stuff for a living. Back during 2005-08 it was astonishing how many institutional investors took leave of basic due diligence. The problem with the movie is that it looks at only half the story — the half it wanted to look at. Maybe a future movie will examine the whole story. Not only is this one of your best movie reviews, it is also one of your most insightful analyses of any kind and a fine essay on money and credit as well. Bravo, and thanks. The Community Reinvestment Act of 1977 was at least partly to blame. It was only seriously enforced during the Clinton Administration and thereafter. Lenders were pressured into lending to less credit worthy borrowers, which were often minorities. People who would have been perfectly happy renters were lured into the housing market through teaser rates and low down payments. Government social policies and sloppy lending practices led to the disaster that gradually unfolded. Clinton decided to invoke the CRA to force banks to make subprime loans to minorities as a sop to his “spiritual advisor” Jesse Jackson. I worked in the banking and mortgage industry for over 30 years, and Debbie is correct that without the government forcing it, and Freddie and Fannie agreeing to buy the crap loans, the mortgage debacle never would have happened. The government basically required us to make loans to anyone who was breathing – especially if they were black – creditworthiness be damned. I remember reading an interview with Jackson at the time this started where he specifically stated that paying bills on time is not something that is a value in the “black community,” therefore white bankers should not force their culture on blacks, and should instead ignore bad credit. The banks balked at the CRA requirements, so Clinton had Freddie and Fannie agree to buy the garbage loans. As the loan programs Freddie and Fannie created and agreed to buy the packages based on became more and more ridiculous (stated income, multi-family purchasers – specifically for hispanics – no legal alien status checks – again for the hispanic markets) I remember being in Officer meetings at the bank thinking, “This is not going to end well.” Wish I had had the foresight to sell the banks short. I was too worried about hanging on to my job when the bubble burst. Outstanding summation of another Hollyweird crapfest Debbie. Keep up the good work. Are you going to do one for that idiot Jennifer Lawrence’s movie Joy? …and Obama’s wookie does not know what a wookie is. They should call it “The Big Lie” instead because the movie completely ignores the role that the government, Fannie Mae and Freddie Mac, and leftists like former Congressmen Barney Frank had in forcing banks to make loans to people who were totally unqualified to get loans. Nancy Pelosi attended the premiere of this movie and it was her that negotiate a Bail Out for banks and investment firms because they needed a majority of democrats in 2008 to pass the Bail Out bill . The movie also falis to mention that federal regulators were Stopped by democrats in the congress to investigate Fanny and Freedy Mack for corruption . The Dowd/Frank bill is not mentioned and it provides for more bail outs . This movie seems to rewrite history for reckless political reasons (Nancy Pelosi attended the premiere)and Hillary Clinton superpac is being funded by Bail Out companies , as well as , Hollywood elitists like McKay . What trash Hollywood puts out. We stopped going to movies many years ago. Why support the enemy? I’ve studied this and the reality is WAY too complicated for 99% of the under-educated American public. The Wall Street journal is rather silly thinking that Alan Greenspan should have created a recession stop the mortgage crisis. He was not going to rise interest rate for that reason and he his low interest rate were vastly out done since he has left. In Alberta Canada there was a massive mortgage default on regular 20% down payment house in 1980s because of the leftist anti-Semite Pierre Trudeau NEP policy. Canada is facing another massive housing bubble. The best way to fix this is people should pay 30% or more down payment on houses. This would keep housing prices reasonable. In addition mortghages should never get prime rates and mortgages should be treated like other debt. New immigrant and dual citizen should pay substantially more in interest payment to cover the risk of them leaving the country. If you walk away from it you are still liable. Alberta had those rules in the 1980s but they have changed. On the issue of people losing their houses. People who pay next to no downpayment pay mortgage payment far less than they would pay for rental and live for a couple of years in the place without even paying the mortgage payment really lost nothing and gained. Additionally this film is quite boring, it felt like a degree in finance was necessary to follow this story. I don’t think it is very objective to combat what you feel to be an extreme liberal point with extreme right wing views. Yes, the government did have a lot to do with it, I think everyone knows that… but that is not what the movie is about. It’s about the guys who uncovered it and profited off it. And the banks were not innocent… Apparently, you didn’t listen to Selena Gomez. The CDOs that were created and then had synthetics created off of them… that is the banks, it was their way to make move money and have more products to meet the demand, they built the house of cards knowing the foundation was crap. They were also the ones going to the rating agencies and bargaining for better ratings. So yes the government had something to do with it… but the banks are not innocent by any stretch. And the lower and middle class is who got screwed in the end, trust me, I had a front row seat. “The Big Short” (TBS) is a smug, arrogant, lying, preachy, gimmicky mess, the narrative of which bears little resemblance to what actually occurred in the mortgage meltdown. Just watched it … this is pretty much a perfect summary.